Asteroid (617) Patroclus will occult TYC 0646-00730-1 on 2013 October 21 from 6:36 to 6:56 UT (Sunday, October 20, from 11:36 – 10:56 PM Pacific Daylight Time). The star has a reported magnitude of 9.6. The star’s position is RA: 02:47:58.8 DEC: +14:05:59, J2000. This is an optional event for RECON and can only be of interest to the southern half of the network. This event is different from the occultations we have attempted thus far. The object known as Patroclus is actually two bodies of nearly equal size orbiting each other. The other component has been named Menoetius. Current information from David Dunham at IOTA indicates that we do not known the relative positions of the two bodies. This makes for a larger than usual region that needs to be covered with observers. The diagram below was provided by David. Shown here is the “nominal” prediction with the usual centerline (green), body edges (blue), and 1-sigma error (red). In this case these curves do not show you where to go, only the size of the shadow for the two objects. 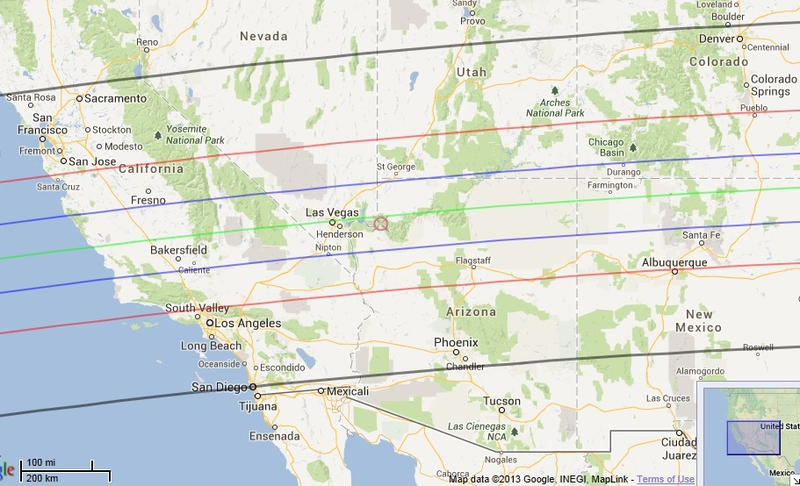 David has added two extra black lines, one just north of Sacramento and Denver and one passing through San Diego. These lines indicate the possible region where the two objects could be found, including some estimates of the uncertainty. Outside the black lines is much less likely to see anything but within 100 km it might still be worth the effort. If you plan to do this event it is especially important to signup on Occult Watcher for your site. The IOTA goal is to get 50 stations(!) deployed for this event. From this diagram, it seems as though Yerington south to Tonopah and Bishop are very definitely in a good place to see something. Gardnerville is right on the edge and probably worth the effort, too. North of that it is definitely a judgement call on trying it. The estimated maximum duration is 8.6 seconds but there could be two events this long. RECON sites should start recording at 06:45:00 UT and run until 06:48:00 UT (three minutes total). Sense-up time should be either 2x or 4x depending on your conditions. Use the one that let’s you see the star and doesn’t have strong flickering in the display. The nearly full moon (95%) will be 11 degrees away and about 54 degrees off the horizon, 2 hours east of the meridian. The moon will make it harder than usual to get on the field. For finder charts and a predicted ground-track of this event, visit Asteroid Occultation Updates. However, most of the critical updates will come out via email. In case of conflicting information, please follow the email. The last column indicates how far the moon is from each star. A variation of the prior pointing techniques we have used at Yerington and Tonopah is to do a “precise goto” to each of these stars on the star hop list to figure out the final pointing offset pattern from the precise goto. You’ll use the same initial star each time (chosen by the telescope though you might want to force it to use Aldebaran each time). By the time we tried this on a few in the list we were ready to go to the final field and it worked really well to get the field quickly. Remember, you want to use sense-up of x128 for finding the field though the moon might give you some trouble at this setting. If so, use a faster setting. Once you’ve got it, drop the rate back to the value above.